1. What is Data Annotation in ASP.NET MVC? Validating user input is not only necessary but it is compulsory these days. Data Annotation provides instant user input checking facility at client side and provides to asp developer, a wide range of validator attributes. Data Annotation makes the validating process easy and quick. Data Annotation attributes directly applies to Model class member and those members are bounded to accept valid user input according to Data Annotation Rule. Data Annotation can be used after adding following namespace. Here, is a list of some important Data Annotation Attributes. Specifies that Input field cannot be empty. Specifies the Display Name for a Property. Specifies minimum and maximum length for a property. Specifies a range of numeric value. Include or Exclude value when adding form values to model properties. Specifies a field for hiding from editor forms. Specifies a display format for a property like Date Format, Currency format etc. It set a property to read-only. Specifies max length of string. specifies that a data field value is credit card number. compare with other input fields. specifies that an input field value is well-formed Email Address using Regular Expression. specifies that an input field value is well-formed phone number using Regular Expression. specifies that input field is matched with desired Regular Expression. provides a list of data type that is associated with input field and parameter. specifies a hidden input field. Let’s understand all these with complete programming example. Step 2: Create a form in Index.cshtml page. 1. I have added several data annotation attributes to model properly. 2. Creation of form is same and nothing changed. Till now, you learned how to use predefined Data Annotation attribute to validate input field. But, what is the way of adding a custom rule in data annotation? Here, I will explain how can, you add your own custom validation rule to Data Annotation. 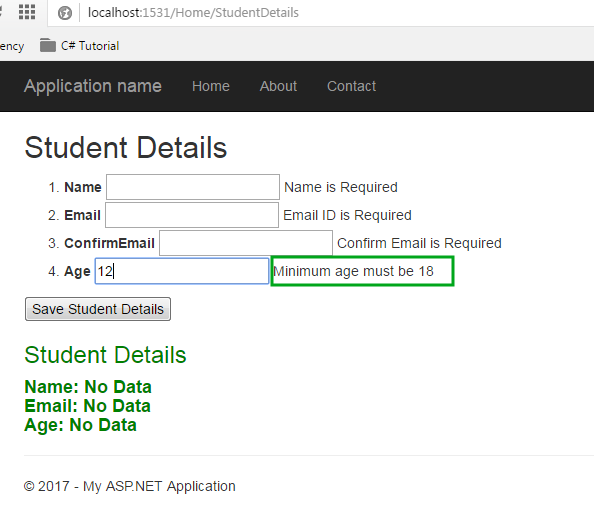 For example, you want to create a custom attribute MinAgeAttribute(), in which user is forced to enter their age 18 or more than 18. This is just an example and after knowing that method of adding a custom attribute in data annotation, you can feed your own rules. 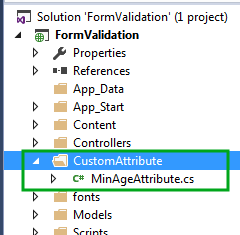 Step 1: Create a separate folder CustomAttribute in your project. Create a class MinAgeAttribute.cs in this folder. Created MinAgeAttribute class derived from ValidationAttribute class. You must add a namespace using System.ComponentModel.DataAnnotations; in order to use ValidationAttribute class. 2. Override IsValid method in order to push own custom logic. In this chapter, I explained how to use Data Annotation for validating input field in ASP.NET MVC 5. I also explained how to add custom validation rule in DataAnnotation. 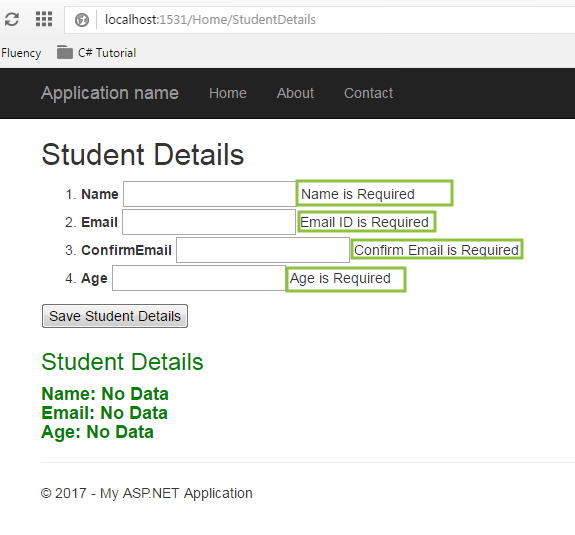 In the next chapter, you will learn Remote Validation in ASP.NET MVC. Remote Validation checks user input field instantly when the focus jumps out from input control.